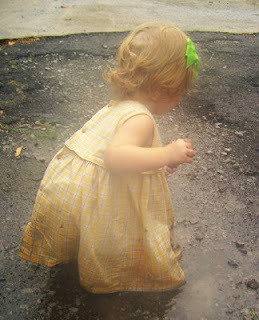 Today I chose mud puddles over blogging. It was glorious! Have you looked into "grasscrete"? 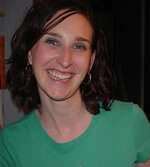 By the way, I LOVE your blog! oh, little girls with bows and dresses ... there's nothing so sweet. How sweet! She must have had a great time! How about crushed rock? this was an inexpensive and lovely solution for our home. We use it in walkways, but have seen it used extensively in driveways in our area. It cost us $26 a ton, which covers quite a large area. You might check Craigslist under the "free", "material", or "farm+garden" categories. I frequently see landscaping rocks & pavers in our area (although we live in a quarry-rich area, so we may have more of that sort of thing here). We had a patio area at a previous home that we wanted to do with pavers but couldn't afford. Instead, we had colored, stamped, and glazed concrete installed. It ended up looking REALLY nice and was about 1/3 of the cost that pavers would've been. I had a similar area to frugally replace. At the time, a local strip mall was being demolished. My husband obtained permission to have all the intact concrete blocks we could use. We dug out the old asphalt the depth of the blocks laid on their side (holes parallel to the dirt surface, not pointing up to the sun), laid the blocks in a running bond pattern, filled in the gaps with soil. If I had it to do over I would have sown creeping fragrant thyme at this step. Subsequent efforts to establish thyme in the cracks has not been super successful. So we keep the grass which has grown up between the blocks very short and it is a pretty little patio area. I adore this picture- I can't believe how big Elise is getting! No suggestions for the asphalt- sorry I don't know more about that, but I will love reading the ideas in your comments! Elise is so precious! I'm glad y'all enjoyed the mudpuddles! Like my momma always said "Take time to stop and... play in the mud puddles" Seriously though, you can not pass up a good puddle with out a good splash or two ;0). Elise and her muddy dress-tail is just precious. i agree! try craigslist.org and freecycle.org for free yard supplies! or what about planting ground cover creeper plants in all the cracks? i am enjoying your blog, too!